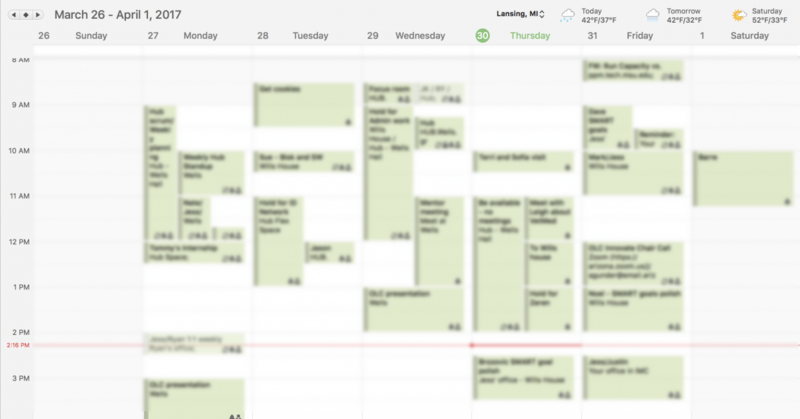 workload – Jessica L. Knott, Ph.D.
My calendar looks like someone threw up on it. This is not a complaint. It’s not a humble brag. It is a fact. I am an overcommitter. I’m even somewhat unrepentant about it. 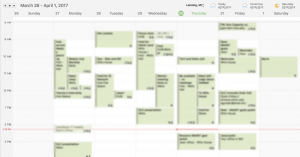 My calendar, with its amalgam of colored blocks, color coding, electronics, paper, and bright-eyed hopefulness that each entry will be accomplished looks… scary. For whatever reason, my brain likens it to those mysterious, multi-colored surprises on the sidewalk you’d rather walk around than step on. This is a pretty light week, meeting-wise.